Shoulder injuries are one of the most common car accident injuries which, in some instances, can be devastating to one’s health. 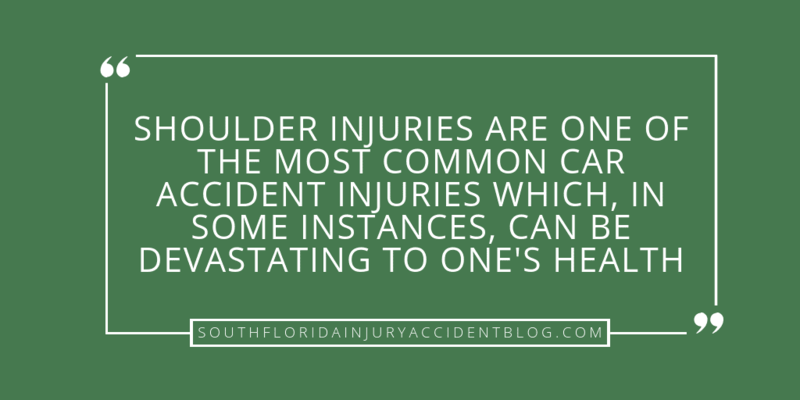 Whether the victim is the driver or the passenger of the vehicle involved in the crash, he or she can suffer severe injuries to his or her shoulder(s) that can last a lifetime. That is because the shoulder is a very complicated joint and considered one of the three most complex joints in the human body. Why? It has a ball and socket connection (as do the knees and the hips). Also, the structure of the shoulder includes interrelated muscles and tendons that allow not only for support of the joint but also motion of the arms, neck, and back. Despite how common this kind of injury is in an auto accident, and the complexity of the joint, victims often face insurance adjusters who dismiss shoulder injury claims which makes these claims difficult to settle. Shoulder injuries aren’t always black and white. Depending upon whether or not the bones are involved, there are many different shoulder injuries that can occur as a result of the impact of a car crash. Below you will find details on each type of injury one can sustain to their shoulder. Doctors recognize that the scapula (the shoulder bone) is commonly fractured or broken from high impacts such as the force sustained in a car crash. This is true due to the fact that the scapula is protected by several muscles and the chest. Another kind of shoulder injury is a “dislocation.” Here, the bones are not aligning in the joint as they should. The dislocation of one of more of these joints after an auto accident can result in a lengthy recovery for a car accident victim. The victim’s recovery can involve ice packs, pain killers, the very unpleasant “popping back in” of the dislocated joint into the socket, or maybe even surgery. Another type of shoulder injury a car accident victim can sustain are soft-tissue injuries. Such injuries are tears (“sprains”) in the victim’s ligaments, muscles, or tendons as a result of the impact of the car crash. There can also be labral tears and rotator cuff tears in the joint itself (the “joint capsule”). In addition to tears, there can also be strains and contusions (bruising) in the soft tissue. These kinds of accident injuries are considered by doctors to be acute soft-tissue injuries because they are caused by a sudden trauma to the body, such as when a car accident occurs. Soft tissue injuries to the shoulder after a car accident can be very serious. For instance, if the car accident causes a severe sprain (Grade 3), then the shoulder ligament is completely torn apart. The joint will not be functional for a significant period of time, and therefore, the accident victim should be compensated as such. 2. Did You Seek Help of a Medical Expert to Treat Your Injury? After a car accident where the victim has suffered a shoulder injury, more than one kind of medical professional can be involved in the care and treatment of the injured person. The treating physician may call in specialists, like an Orthopedic Surgeon to consult on whether or not surgery is warranted. Medical experts can be expensive, which can increase the value of a claim. Be aware, an insurance adjuster may claim the severity of a shoulder injury did not warrant surgery or the intervention of an orthopedic specialist. Due to the complexity of the shoulder joint as well as the variety of damages the joint can sustain in the sudden impact of a car crash, these injuries can be very difficult to treat. Shoulder injuries may require more than one surgery, as well as prolonged physical therapy and rehabilitation. The victim may suffer long periods of time where the his or her shoulder is immobile. Afterwards, the shoulder may have a limited range of motion during the healing process. Sometimes, the shoulder joint does not recover full mobility, in which case, there is permanent damage and impairment. Even if there is a dislocation or separation without any fractures, there can be weeks or even months of recovery ahead. The duration of this process can vary depending on how many broken bones are involved. However, if a fracture is involved, this can mean months of specialized treatment and oversight of surgery and surgical recovery as well as immobilization, rehabilitation, and therapy. From a legal perspective, because of the difficulty in treating an injury to a shoulder joint, an insurance adjuster may need to be educated about the accident victim’s pain and suffering. After providing the adjuster with the victim’s medical records and his or her course of treatment, the adjuster should acknowledge the victim requires an increased amount of medical care and treatment to help recover from his or her injuries. In other words, depending on the course of treatment and the length of recovery, some shoulder injury claims can be larger than other bodily injury claims. 4. What Caused the Shoulder Injury? The nature of the shoulder injury itself may provide evidence on the issue of negligence and the cause of the injury. For instance, if the shoulder injury is sustained on the driver’s left shoulder, then the driver’s seat belt may have caused some of the harm. How? While it is true that the use of a safety belt saves lives, it is also proven that safety belts can cause injuries in a car crash. This is true, regardless of what caused the car accident. An insurance adjuster will investigate if the belt itself caused the harm to the shoulder because of mis-use or because of a defect. If the adjuster can support this argument, then he or she may use that as an excuse to deny the claim or make a low-ball offer. Thus, a victim may need an expert opinion (this can be done via a sworn statement and/or a deposition), not only from the doctors, but also from industry experts, on safety belts and their use and operation. It is important to any injury claim that the car crash victim be able to establish the other driver was at-fault. The insurance adjuster will try through all means necessary to assign fault on the injured victim to avoid paying any compensation. What speed was his car being driven at the time of the accident? Was he speeding? What were the road conditions at the time of the accident? Was the driver being reasonably cautious and aware of the weather conditions and dangers, like standing water on the roadway? Was the driver on the phone? Was he chatting with other passengers in the car? How old was the driver? How much experience did he have behind the wheel? Read: Was The Driver Reasonable in Your Loss of Control Crash? 5. Is the Shoulder Permanently Injured because of the Car Accident? When a shoulder has been severely injured in a motor vehicle accident, there can be a life-altering change to the body and the joint may never fully recover. There can be limitation of movement resulting in loss of control of the arm or hand to some degree as well as extended pain and trauma. Arthritis may also develop as a result of a shoulder injury. However, these shoulder replacements are not as successful as other types of replacement surgeries. Any claim valuation must include the potential need for continued treatment after replacement surgery has occurred, along with any possible complications, risk of death, pain and suffering, disability, loss of consortium, etc. An insurance adjuster may consider these claims as unnecessary or unreasonable which is why your demand package needs to be complete when making a claim. Thus, you should include your medical records and the doctor’s recommended course of treatment. If true, shoulder injury claims should include a written opinion of a medical expert that the damages are permanent. The loss of use of the shoulder joint can not only impact the victim’s enjoyment of life, but can also impact their ability to earn a living. The accident victim will need the written opinion of the expert to convince the insurance adjuster the procedure was medically necessary. This usually comes in the form of a written statement by his or her doctor after treatment is completed, where the doctor will give a doctor report stating the permanent partial disability with the impairment ratio in a percentage format. When an accident victim presents their injury claim to the at-fault drivers insurance adjuster, he or she needs to be prepared to go to trial if their settlement offer is excessive. This means that they should reasonably “value their case” as part of their negotiation strategy. How much will the insurance company be willing to pay on this claim in settlement? What’s the bottom line that the accident victim is willing to take in settlement before taking the case to a jury? In a shoulder injury, the victim must consider not only how serious that shoulder damage is (and the likelihood of permanent harm), but also how a jury would view their claim. How likely is it that the jury will find the other driver responsible for what has happened? Experienced personal injury lawyers will be able to help in this analysis. Their past experience with juries – as well as their experience with adjusters and insurance defense lawyers – can be invaluable here. Shoulder injuries will have some damages that are easy to calculate, and others that are not. There are two main categories for damages that an accident victim may receive: economic damages and non-economic damages. Economic damages are those that are monetary, such as medical expenses. These may include emergency room treatment, hospitalization, doctor’s visits, and physical therapy. The impact on the ability to work can be shown as monetary damages, as well. Some permanent shoulder injuries can mean the loss of a career and therefore, lost wages. For example, a commercial truck driver may no longer be able to drive a big rig after a serious shoulder injury. His claim can include documentation to show how he must find a new line of work. Often times, shoulder injuries may mean a long-term career adjustment. For instance, a high school basketball coach who can’t shoot baskets any longer can still teach, but his job is still impacted. Finally, in a shoulder injury claim, it is important for a victim to understand how a jury might view a claim so he or she can understand how liability may be assigned to the parties. Will they find the defendant sympathetic? How strong is the evidence showing that driver at fault? And what will the jury think about that shoulder injury? Will they think the seat belt contributed to the shoulder injury? Will they discount the severity of the shoulder damage? Will they disrespect the soft tissue injury? In any car accident, even if you don’t feel any pain at the scene, the first thing to do is to seek medical treatment. Shoulder injuries are sometimes not obvious. They can take days, or even weeks, to manifest themselves. Additionally, a good piece of advice if you have suffered a car accident related shoulder injury, is to speak with an experienced Florida personal injury lawyer to learn about your rights, including learning how most insurance companies respond to shoulder injury claims and the type and amount of damages you may be entitled to recover. Most personal injury lawyers, like Alan Sackrin, will offer a free initial consultation (over the phone or in person, whichever you prefer) to answer your questions.